This collection of top notch Musicians/Artists have been performing together since late 2004. They are dynamic blues performers with world wide credentials. Traditionally when traveling out side of Tenn. & the United States we travel with a 5 man core, minus Nat Kerr. When the budget permits, we are honored to have Nat join us on any gig!! Also Barbara & Nat are available for duo gigs (They have been performing together nightly on Beale Street for 13 years!)... given enough forewarning they will customize your event!! Yes, being Nominated the 2007 BMA Contemporary female artist of the year Barbara Blue is a professional blues performer but this does not limit her and her band/duo from being able to handle all of your musical needs. Along with Barbara's list of original music, all shades of blues and R&B are masterfully crafted to show the raw, the HOT & sweet BBQ side of this American culture musical style, BB and the band/duo can also cover a wide range of genre from Memphis, the Delta, New Orleans, Chicago, Detroit etc..... Blues, Jazz, Funk, R&R, 50's, 60's, 70's, 80's... etc... We guarantee a good time to be had by all!! Festivals, Clubs & Bars, Private Parties, Weddings, & Corporate Events... ALL are welcome! Nat has been playing keyboards from a very early age... with Barbara Blue for 11 years, mostly 5 nights a week on Beale Street at Silky O'Sullivan's. 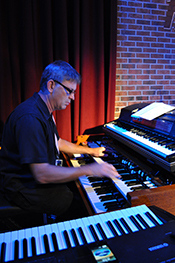 He holds multiple credentials for composition, accompanyment and recordings. "It doesn't get no better than Nat!!" PBS - Fallingwater: a Conversation with Edgar Kauffman, The Inside Story, Frank Lloyd Wright and Japanese Art. Born in Memphis TN………Almost every Record that has been produced by Grammy Award Winner Willie “Pops” Mitchell and his Hi Label, has had Lannie’s horn tracks or prints on it. He’s been around the word more times than the space shuttle. He is a true master of his craft and a delight to be in the company of especially when playing music. When there is referral to “Back in the day”… well Lannie McMillan IS the day!! Steve has been featured as an arranger and trombonist on many recordings and TV themes for Nickelodeon, TV Land and Showtime. He has played with Wild Cherry, Billy Price, The Temptations, Frankie Valli and the Four Seasons, Little Anthony, Ronnie Spector, Leslie Gore, Peter Noone, Crack the Sky, B.E. Taylor, Joe Grushecky, Sputzy and the Soul Providers and many more. 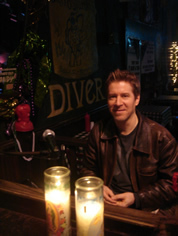 Steve owns his own sound company, Graham Audio, and travels worldwide as an audio engineer. He’s worked corporate and sporting events and has worked as an audio engineer for the G8 Summit, APEC Summit, Stanley Cup Playoffs, Versus, NBC, TSN and Fox. Steve has been with the Pittsburgh Steelers managing the coach to coach and coach to QB intercom system since 2008. Some of Steve’s music audio highlights have been mixing for the Count Basie Orchestra, The Artie Shaw Orchestra, Jeff Coffin and the Mu’Tet, Brian Setzer Orchestra, Sharon Jones and the Dap Kings, the P. Funk Allstars, Susan Tedeschi, Brave Combo, Pure Prairie League and Jefferson Starship. As my heart breaks I write to tell you of the tragic loss of a great talent, a great friend and a great person my beloved guitar player for the past 5 years +. No words can describe the devastation on the rest of the band members, his family and all of his adoring fans on Beale Street, in Pittsburgh PA and around the world. God bless you my friend and keep you in the palm of his hand. You are dearly loved and will be dearly missed. Friday, November 28, 2008 A 23-year-old area musician died this morning after crashing his car while driving on the unfinished portion of Tenn. 385 in east Shelby County. Corey Scott Osborn of Arlington died at the scene after his Mitsubishi Montero slid off the unfinished road onto the left median. His vehicle rolled numerous times before coming to a rest in the opposite direction he was driving.Osborn was namesake of his own blues band and a was regular performer on Beale Street and area nightspots.A Bolton High graduate, he began playing the guitar when he was 11 years old. By age 16, he played regularly on Beale Street and became a frequent performer at B.B. Kings Blues Club.Osborn was the only person in the vehicle. The accident occurred about 3 miles south of U.S. 64.TDOT dispatcher Bill Dunn said Osborn was possibly driving at a high speed and evidently disregarded the barricades and continued onto the unfinished portion of the highway. Born in Memphis TN……. Corey’s professional career began at age 15, playing nightly up and down Beale Street. 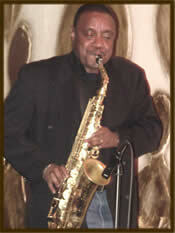 Now as a regular performer at BB Kings on Beale Street 2, 3, 4 nights a week for the past 4 years with his power quartet. Corey is almost a veteran… ok, well at least and Eagle Scout at the Young age of 22. 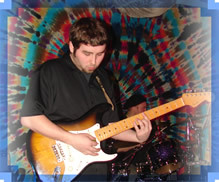 He holds the position of guitarist and is a founding member of Barbara Blue’s touring band “The Soul Providers”. Performance credits: Corey has opened BB King’s yearly appearance at the Beale Street Club in ’03, ’04 & ’05 and each time was invited to jam on stage with the master himself. Along with this huge honor he has been featured on the Beale Street Caravan Radio Show, opened for The Black Crows (98.1FM Rock The Dock) and performed with Barbara Blue (Nat Kerr & Lannie McMillan) for the 28th Annual Blues Award Show 2007 (Barbara was nominated in the category of “Contemporary Blues Female Artist of the Year), Corey has shared the stage with: Eric Sardinas, Eric Gales, John Daily, Josie Scott, Kenny Neal, Rayford Neal, Guitar Shorty, Joe Bonamassa, Willie “Big Eyes” Smith, “Steady Rollin” Bob Margolin, Charlie Musclewhite, Preston Shannon and more. In 2007, Big City Blues Magazine released a sampler CD of their favorite new blues artists & Corey’s song “My Belair” was a featured track. © 2017 Barbara Blue. All Rights Reserved.